There are 5 episodes of Impact Wrestling left before Homecoming on January 6th in Nashville. 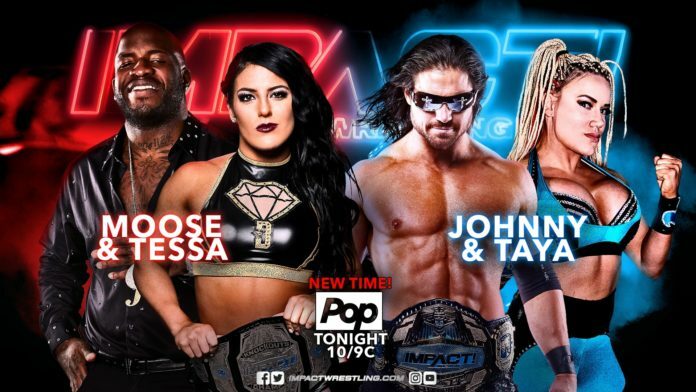 Tonight, Impact Wrestling will further the build to their next PPV. Johnny Impact will face Brian Cage at Homecoming but tonight he’ll team with his newlywed wife, Taya Valkyrie. The Knockouts Champion will team with Moose, who is hoping Eddie Edwards is not released from Shady Acres Mental Institution in time to interfere in this match. Last week on Impact, Blanchard attempted to strangle a referee until Gail Kim ran out and pulled her off. It’s possible we hear more about Gail Kim’s potential involvement with Blanchard tonight. Killer Kross might be watching this match closely as well. He again offered to watch Johnny’s back last week. Allie returned from the undead realm at Bound For Glory without her soul. Now a dark passenger is along with Allie wherever she goes. Kiera Hogan believes there is still good inside of her, however. Hogan made an emotional plea last week for the good Allie to come back. Tonight, Dark Allie will return to Impact Wrestling. Wherever she goes, Su Yung is sure to follow as well. Willie Mack will go one-on-one with OVE’s Jake Crist tonight. The winner will be granted one of four spots in the Ultimate X match at Homecoming. Mack hasn’t been in Impact Wrestling for long but he’s already in a spot to potentially win a major title. Third-eyes will collide tonight as Matt Sydal goes one-on-one with his protege, Ethan Page. Sydal is the former X-Division Champion before dropping the belt to Brian Cage at Slammiversary. He once said the X-Division title was his calling and it’s possible the belt is calling to him again. He’ll have to get by his own pupil to get that chance, however.